Seller: Premiere Radio Networks, Inc.
© Premiere Radio Networks, Inc.
Amazing magazine. But please add to newsstand. The newsletter isn't optimized for the phone at all. It's just a giant picture. "Mobilize, don't minimize" is completely ignored here. However, one nice thing about them using flat pictures on each page is that it makes the newsletter easier to pirate for free. Not that I do that, I think Rush is destroying our once great party. This "free" "app" is just a subscription service in disguise! It's beneath even Rush Limbaugh, well, maybe not. Claims you get a free preview of his "newsletter" when all the app does is tell you that your subscription has expired and you should spend $30 to subscribe to this joke of a newsletter. Really Rush, where's the substance to back up your endless wind? Go back on the Oxy and stop trying to take advantage of ignorant people that are desperate for you to tell them that they belong to your club. As a former broadcast journalist, I recognize the true genius of Rush's broadcasts. The Limbaugh Letter is an addition to the broadcasts that allows me to catch up when I am not able to listen. In addition, each issue includes articles that are found nowhere else! I'm sold. Outstanding publication. I loved it in paper and I love the digital accessibility even more. Truly a pioneer of the Information Age. Such a good app! Getting the TRUTH out!!! Best political newsletter in the world! Great little app. Lots to read and easy to navigate. Now I have access to the brilliant political mind of El-Rusbo anytime, anywhere. Gave it 4 stars because: Text size not adjustable in page view - as an alternative, may I suggest a choice of "column width", which would be especially useful on iPad Mini and Smartphones, and would allow the graphics to be displayed. The most recent issue doesn't really download - example - current issue is May 2014 - it says downloaded, but as soon as the network connection is removed, it says unable to display. Conversely, all the older issues which are downloaded are available to read offline. Odd. Reducing to 3 stars. Does not retain ANY recently downloaded issue - it's there, alright, UNTIL you want to read it, like on a plane, then it says not downloaded - no network connection. SINCE WHEN did DRM become such a big issue that MY purchased copy becomes invalidated as soon as the network connection is lost? Completely unacceptable - think like a Kindle! I don't read anything like this anymore because of the internet, my iPad etc, but I will read this. Thanks Rush! Rush shows the drive-by media how it's done in the real world. Real News Stories and Interviews that puts the Liberals to shame! Outstanding! Are you ready for some Rushball?! Breathe of fresh and HONEST air. Keep it up Rush! Finally a digital version. I love that there are back issues available. Especially nice is that you can view the "print version" format, which is great on an iPad, and also a Text version that makes it easier to view on an iPhone. He is always spot on and up to date. Thanks to this app I can keep even more current with what he has to say. Thanks for a great app Rush! 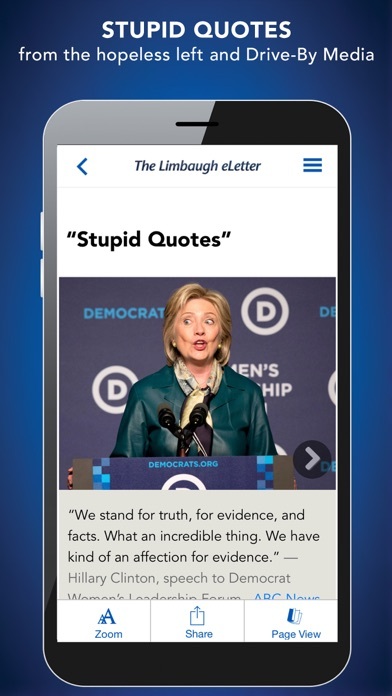 I really was excited to finally subscribe to the Limbaugh letter, having been listening to Rush since the beginning. I was able to download the July and August 2017 issues to my iPhone without a problem, but not the BONUS about 15 Liberal Lies. It keeps putting me in an endless loop asking me to sign in over and over and over. I have sent 3 emails with my case number in the subject line. They sent me one stock reply telling me to reset my password (why...? the other downloads worked fine) so I know they are not paying attention and seemingly don't care about customer support. As another reviewer stated, Rush praises all things Apple and knows a lot of techie stuff. I have learned some cool things about the iPhone from him. So I really don't understand why he tolerates poor customer service in his own company. I would think it would be embarrassing to him. So what choice do I have but to wait for someone to eventually reply, keep trying to access the BONUS on my own, and hope that Rush Limbaugh himself becomes aware of the mediocre reviews and fixes his app? His name is on it. 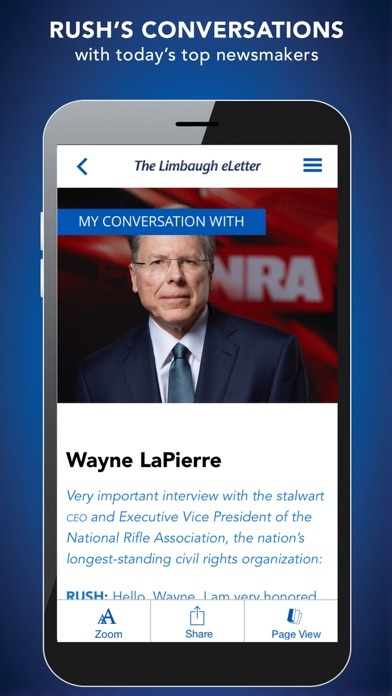 Thanks Rush for putting the Limbaugh Letter at our fingertips. This is always packed with the BEST information. Read it cover to cover and stay INFORMED...Mega Dittos! perfect! they waited until it was perfect before releasing, and it is! your political leanings aside, this is a clinic on how to create a perfect app! aesthetically pleasing and wonderfully functional, this is Excellence in Applications. Rush strives for perfection in all of his endeavors, and this is the reward for being a consumer of Rush. Reassuring to see this medium used at its maximum capacity. (I hope this eventually appears in the newstand of my iPad, but this is me being too picky!) Highly recommended! I have been a print subscriber about 15 years, so it is nice to get the articles online. Only improvement would be to archive articles to be able to access when not connected. Crashes every time on my iPad. For ElRusbo to be such an Apple aficionado, seems the EIB would have a dedicated iPad app. This is the most bigoted app/article יגיח יעד. This man shames America. Good app, GREAT content! It's also free, and not pretend free like many apps that you then have to pay for the content, really free. Mega dittos - great app! 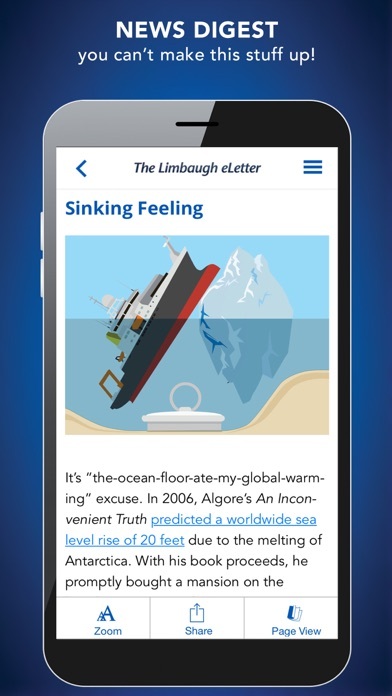 It's the Limbaugh Letter on my phone - doesn't get better than this! Thanks Rush! An interesting newsletter full of news digests, quotes, opinion, media montages, history, political philosophy, economics, culture and interviews with news makers of the day. If you want to be fully informed this is a must read. A concise compilation of all the information that the left does not want you to know - including Kennedy's 1962 speech about how lower taxes increases revenue to the government while simultaneously reduces poverty. Did you know that the EPA was created by Nixon and that most Democrats voted against the Civil Rights Act? While Reagan was winning reelection in a landslide, 87% of the media was voting for Mondale. Be informed; be amused; be energized - now with the convenience of your iPhone, iPad and iPod. While I like the paper version, I travel so much that I'm often reading too late. Now it's not a concern. Thanks Rush! It works great! Flat-out awesome reading experience! Thank you El Rushbo! Tks Rush for your generosity !! Should have purchased it when I got 24/7 which I use 5 to 6 times a week! Would be a 5 star app if it wouldn't crash on startup! Have never seen an app where they took the print version and basically rendered each set of facing pages as one graphic which is too small to read without zooming in. If you select the text option that is all you get; there are no graphics to accompany the story. This is the lazy way to take a print publication and turn it into an iPad app. The Limbaugh organization should be able to do better than that. Are you a robot? Are you a mindless, sound bite driven, drone who refuses to look into facts? Are you satisfied being fed a line of media bias? Are you the recipient of an "Obama Phone?" Are you not paying any federal income taxes? Do you believe in global warming? Do you believe the U.S. is the root of all problems. Do you believe capitalism is only benefitting the "1 percent." Do you believe the Democratic Party has your best interest at heart? Do you (really, really) believe we, as a country, are on the right track? If so, do yourself a favor - don't even bother with this app. Why? Because you apparently have all of the answers already! Zombies rule!!! Right? Very informative and thought provoking as Rush always is... The app gives you access to previous letters and allows bookmarking and many other functions. Fantastic! I love text mode where the text is larger, but more importantly, they have links to articles to BACK UP what is written here. Liberals beware - facts are sticky things that can change your minds! Now I can prove facts to libs anywhere! Thanks Rush for doing this!!! Wow! When I found this app, I couldn't believe it was free. I don't know if it will stay free, though, so get it while you can; however, I would willingly pay for this app. Don't get me wrong. This app is worth any price! It's Rush Limbaugh what's not to like. Trying to help make people smarter one day at a time. 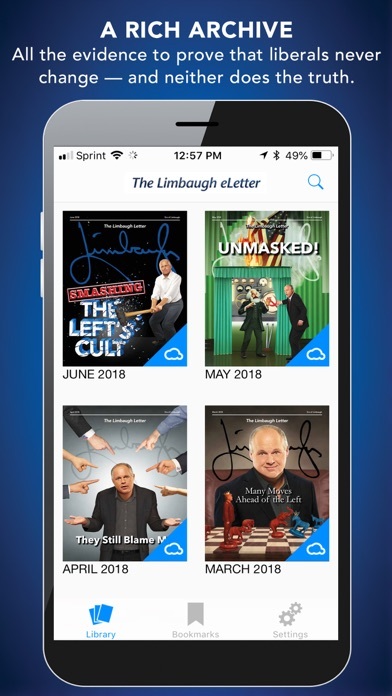 We all know how generous Rush is to his callers (awesome apple products), but now he's gifted his listeners with the highly respected Limbaugh Letter...for free! Rush understands that some of us are hurting, but we still need good conservative thought. And here it is! Thanks Rush. I am a Rush baby. 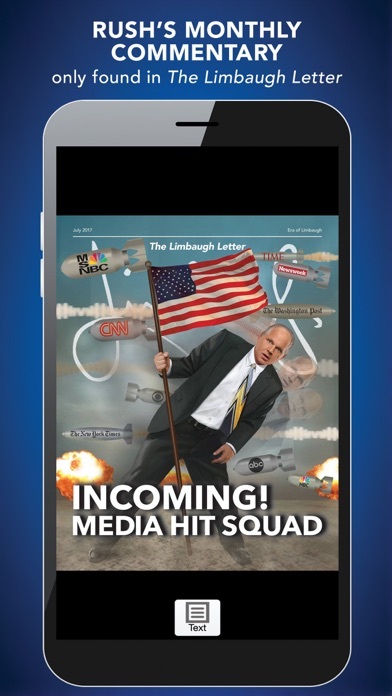 Love the Limbaugh letter! This app is exactly what I have been waiting for. Love having my Limbaugh Letter wherever I go! Like having access to back issues also. Thanks so much Rush! I have ammunition at my fingertips at all times. Please make this app friendly to those of us reading on Ipad in landscape mode. Can’t use until that is fixed.